To say this weekend was eventful would be a huge understatement. I usually don’t like to plan more than one major outing during a weekend because I love the downtime and just hanging out with Scott. For some reason, this weekend started out with only one thing calendered, and snowballed from there! Friday night we headed downtown (again!) as I had scheduled a tour & tasting at Lost Spirits Distillery. 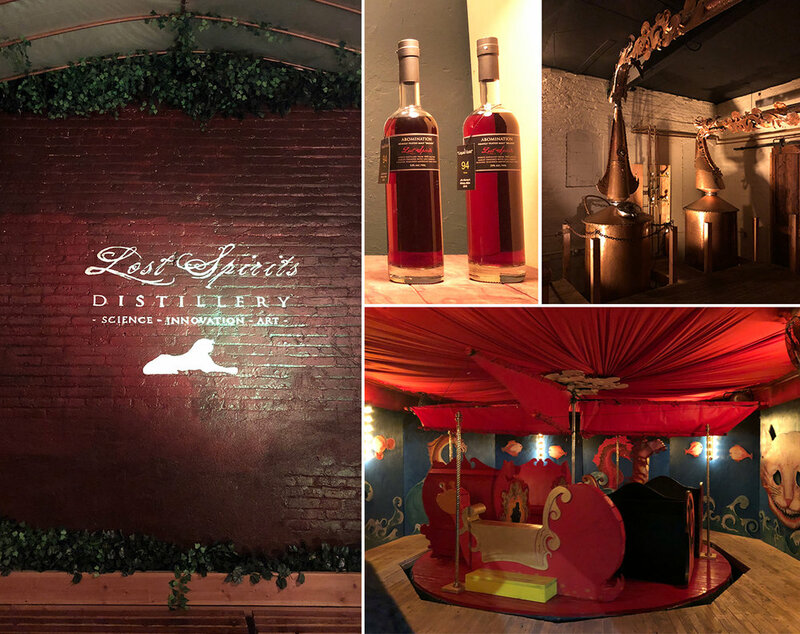 We have already visited two other distilleries in the area, Greenbar & The Spirit Guild, but I had read that Lost Spirits has a very unusual tour, and we were curious. Unusual is another understatement, and while it was a little kitschy, we had a blast. Think, a cross between Willy Wonka, Pirates of the Caribbean, the Jungle Cruise & the Tiki Room. I’m not kidding. Housed in an industrial building, that looks quite small from the outside, you are taken on a tour that begins with a tasting of their bespoke rum, and then guided into a boat which delivers you to the still room. The story of their origins is fascinating, and they get 1000% for creativity and enthusiasm. As if the boat ride wasn’t enough, you are shuttled onto a floating carousel (see above) which delivers you to another stop in the production chain. It was very well done, and we had so much fun! Unfortunately, it is kept very dark, so photos are difficult. If you happen to live in the Los Angeles area and up for something unusual, I highly recommend this experience! There was a great exhibit of some lesser known Rembrandt drawings and his India inspirations as well as a great exhibit of early American photography. And the gardens – no expense is spared, it is breathtaking and it was a gorgeous day to boot! Sunday was Earth Day, and Metro Bike Share was celebrating with free rides. There are several bike stations in Venice, so we headed there and rode around the Venice Canals. In all my years of living in Los Angeles, I’ve not been there! This is definitely on the Be a Tourist in your Hometown list. 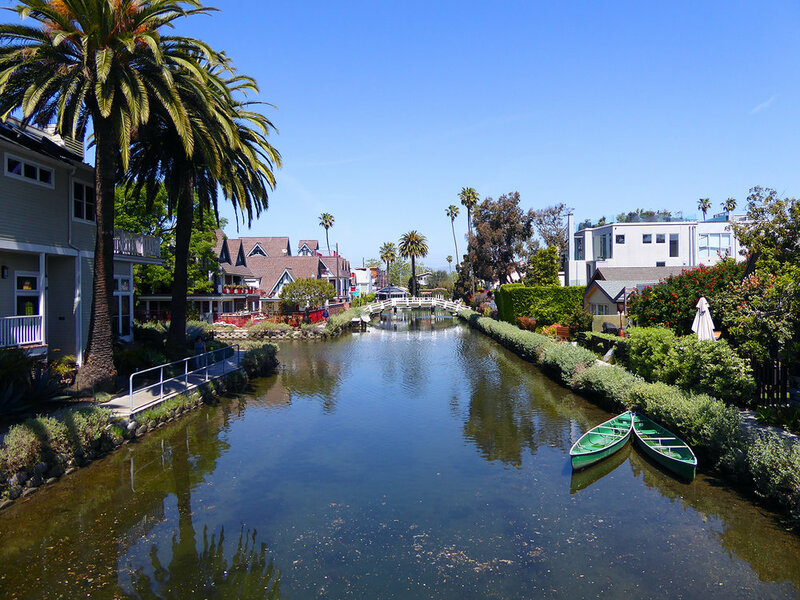 The Venice Canals are an area of man-made canals built in 1905 by Abbot Kinney in an attempt to recreate the appearance and feel of Venice, Italy. It’s an adorable area, and hard to believe that the hustle and bustle of Venice Beach is so close, not to mention Los Angeles and all its’ traffic. There are little bungalows dotted between modern architectural dreams, with footbridges and one-way auto bridges on a few streets. It’s so beautiful, and even with the remodeled homes has a certain charm that is unfound anywhere else in Los Angeles. The weather this weekend was perfect for all these excursions! We finished the afternoon Sunday at The Rose Cafe in Venice where we indulged in a little day drinking and people watching. It couldn’t have been better.